April 18 brought 36 degrees under clear blue skies. A hint of spring revealed itself in the form of two wood ticks hanging from the lazy cat soaking in the sun on the patio. It felt a little symbolic after 5 months of winter but I was unsure yet if I were the cat or the tick. As much as I hated to admit it I was probably a bit of both. With a forecast in excess of eight inches of wet snow on the way, a pond that is still frozen, and night-time temperatures hanging around the 20 degree mark, it was a stretch to convince myself spring was indeed here. Relenting to the thought I grabbed the camera and threw on a sweatshirt while plucking both ticks from the cat as I strode across the patio. Shaking them in my hand like a pair of dice I tossed them onto the driveway where the birds will likely find a quick meal. I continued on my path to the edge of the woods sucking in a deep breath of sweet fresh air before planting both boots onto a mixture of snow and mud. It’s my annual survey or checkup if you will. I assess the property and the many changes that have taken place in the course of a year. As well I document any wildlife or signs of wildlife. I make small land management notes such as specific trees that should be cut or access trails that need to be trimmed. 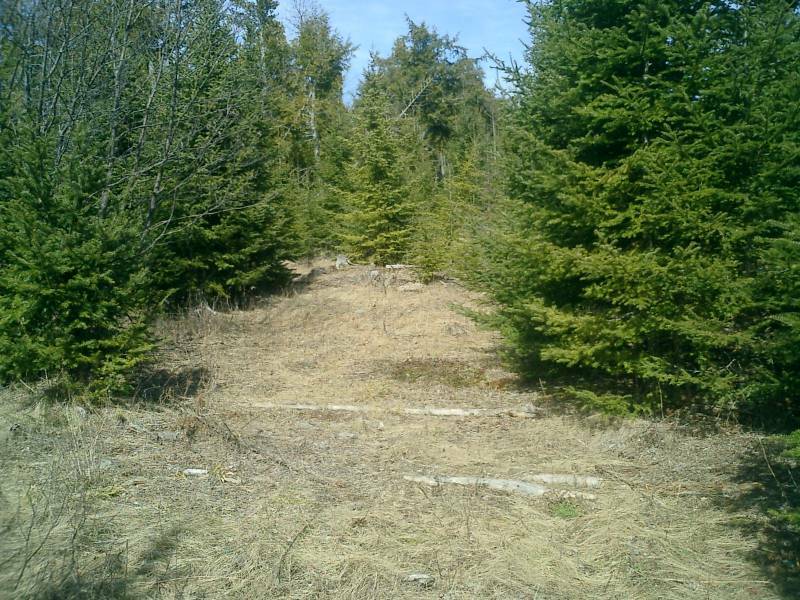 Windfalls are the biggest cleanup jobs when they obstruct foot travel to and from hunting areas but are a vital part of the process to keeping trails silent on approach to deer stands. When I bought this property 16 years ago it had been cut two years prior but small stands of mature trees were left in place. I doubt the previous owner had an actual plan but it played out perfectly allowing a shot as deer traveled to and from each chunk of forest. In truth I think those areas that were left were simply too wet to cut for the most part. Back then I envisioned the future of the land rich in fields of clover filled with all the high-nutrient legumes the deer could swallow. When I realized the time and money involved in clearing the land of stumps and all the brush that was left behind I opted for reality and began creating smaller enhancements to start with. Besides, there were already dozens of deer on this 40 acre parcel browsing the fresh growth result from the recent removal of the overhead canopy. In hindsight it was the deer that needing more managing than the land. I’m barely 50 yards into the woods when I spot two ruffed grouse about eye level on a tree just before they take flight. The thunder of their wings brings my senses to full attention as I scan the ground for more birds. I haven’t shot a grouse on the property in over 4 years due to their population levels. In the last couple years I’ve been seeing more birds and if the trend continues this fall I might take a couple for the frying pan. I’m not surprised to see these birds here. Years ago I dumped a half dozen wheelbarrow loads of gravel on the ground less than 30 feet from where these grouse took flight. Whether they actually use this pile of gravel to help in digestion I cannot say but that was the idea and the birds are frequently spotted here. Give them something simple that becomes a necessity in their eyes and it in turn becomes a positive attribute to the property. As I said my realistic land management ideas are small investments that create at least an equal impact. Mid April still finds snow on the ground with a new snowstorm in the forecast. A minute further down the trail I pull the first tick off my neck and start to see a few more deer tracks. A rabbit sits as still as stone under the branches of a balsam. It’s silhouette is black against the backdrop of the few remaining areas of snow. I continue slowly without stopping, completely forgetting about taking a photo as I begin to deduct the fact that these small game animals moving about openly likely point to a lack of predator presence. It contradicts what I expected to find as it became common throughout the winter to hear the huge pack of coyotes practically every night. They had raced up to the edge of the yard on numerous occasions bringing with them the feeling that they might run right through you. And then the pack would go completely silent in an instant without ever showing themselves. At times this took place as we sat around one of our winter bonfires roasting hotdogs and marshmallows. Standing at full attention peering into the darkness while adrenaline surged uncontrollably, the fire cast shadows on the crisp white tree-line. Imagination pegged at full throttle we expected the coyotes to break from the cover at any moment with a barrage of yelps and barks. But it never happened. Again they seemed to simply dissolve into thin air. And when the rush of human emotion subsided we usually ended the evening without hesitation and slowly found our way back to the safety of the cabin. Still holding firm to the sharpened sticks, nervous chuckles took place of actual speech once inside. This deer skull with antlers attached is likely the leftover result of predation. Unfortunately not all the local animals were quite as fortunate. Near the end of our property I find a decent buck rub and the skull of a 3 point buck, antlers still attached, setting next to a pile of brush just a short distance away. I fish it out and upon closer examination it appears to be a couple years old. There is some damage to it’s snout and there are no other bones in the immediate visual area. I suspect coyotes or wolves, but likely the coyotes, due to the fact that the rest is missing. 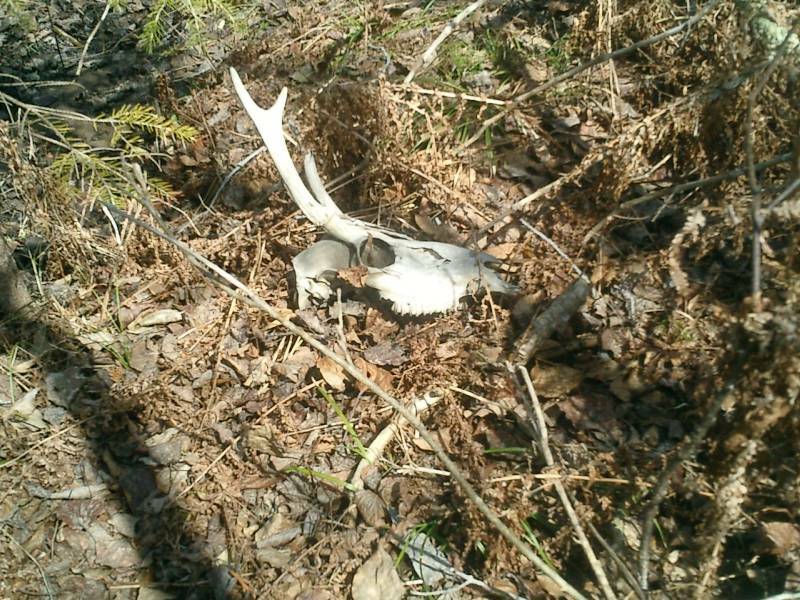 This deer wasn’t picked over by scavengers in a single area and it’s natural behavior to find bones strewn about where pack-predators have been feeding. I don’t know if it’s just my vivid imagination but I witness the attack take place in my mind as I hold the skull by the antlers. Much like the cold nights around the bonfire the feelings play forward, surrounded by coyotes, this time you know there’s no escape. Wood tick number two! Again crawling on my neck, the tick grabs my attention and motivates me to focus on the journey and not the daydream. As I make a small loop through the woods I find an area where the cedar trees have been toppled by the wind. Late winter winds pushed the cedars over and you would be hard pressed to find anything green on the trees even though they’re still alive. Feeding from the roots that are plunged into the ground like fingers deep into beach sand, trees like this often continue to live and grow until they succumb to disease. It’s likely the deer came along and utilized the cedar as a food source. Often you will find in logging operations that take place during winter there will be deer that associate the sound of a chainsaw running or the sound of a tree falling to food on the ground. It might sound like an old loggers joke but ask anyone who cuts in the woods during the winter where they endure harsh conditions and whitetail deer reside. I have myself watched deer run to the fallen tree once the saw is shutoff. They will strip the cedar clean of anything green on it’s branches even bedding down next to the tree until they can eat again. You may hear it referred to as a deer yard when deer arrive in large numbers, sometimes in the hundreds. And with the way the long grass is packed down here it’s fairly easy to see that the deer more or less trampled the area for the food. I can imagine the coyotes picked-up on this quite quickly and, although I see no sign, took advantage of the situation. Even though these cedars are laying on the ground they are not a problem and I will wait to see if any re-growth occurs. If not they will get cut in the fall for kindling. The trees have begun to reach a real growth rate that is easily noted from year to year. What I’ve really noticed this year is the explosion of tree growth. We’ve reached that point where growth has become easily noticeable and the trees are competing in height. In some areas it’s pure pine trees coming back as native growth whereas other areas the poplars have taken over and created a nice transition for the deer. Most of the old patterns defining the old growth and new growth trees are becoming less distinguishable unless you look at the larger picture. The property use to hold a lot of ash and birch trees but the Birch Leaf Miner and the Emerald Ash Borer changed that landscape in a single season each respectively. We salvaged most of that wood for the woodstove before it fell to the ground. From within the woodlot the age of the growth is discernable only by the size of the trunk and the light that still gets through the younger forest canopy of deciduous trees. No longer can you stand back and see far enough to visually realize the different stages of growth. It’s becoming a nice mixture of trees that proliferate in sections each providing something different for the deer and small game. Mother Nature has dealt a decent hand when it comes to this section of property. Again, this year and more pronounced than previous years, I see a lack of water sitting in the woods. This was a place that required knee-high rubber boots at minimum in the spring to get anywhere. It was like a flooded riverbank for the most part. Now, our low water table in the area coupled with the years of sunlight getting through to the ground I could feasibly walk almost anywhere on the property with your basic work boots on and, providing I were cautious, walk away with dry feet. The dynamic has changed most of the property as new plants have emerged and some of those that produce berries have become important for the grouse. Others like pampas grass with it’s tall dried bamboo-style stalks topped off with it’s feathery plumage create an impenetrable barrier that’s perfect for bedding deer. You absolutely cannot get to deer within this grass without setting off the alarm. And, since the grass has proliferated to the point of nearly becoming invasive the deer can safely bed in the grass for the entire day if required. Great for the deer but not for the hunter. 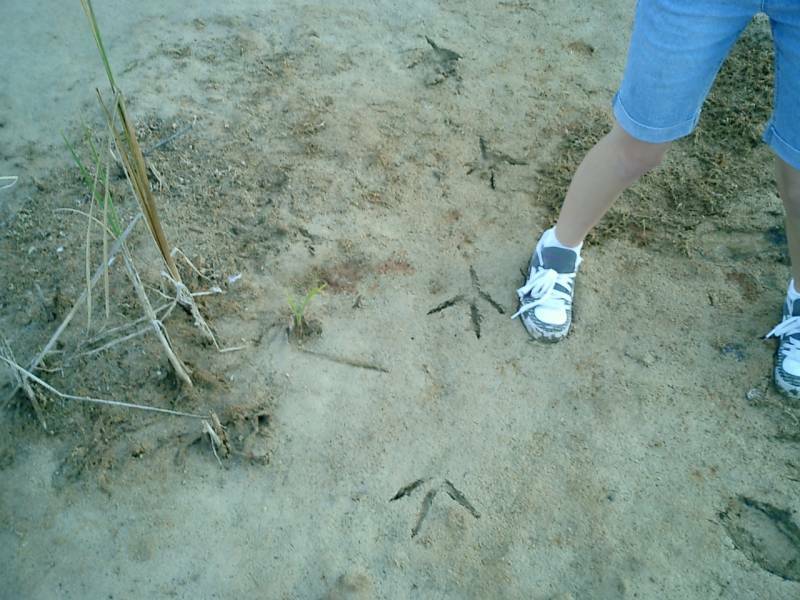 Tracks like those of the crane appear frequently in the soft mud of this one acre pond. While certain areas of the property hold small pools of water throughout the year the vast majority of big game animals, predators, and waterfowl, find their way to the pond that was excavated about 10 years ago. A pond is no small land management or enhancement project so it wasn’t even on my radar. It came in the form of a gift when the county approached me to sample a portion of the property for sand deposits. Fortune smiled as the testing found enough sand deposits to create an offer that ended in a very nice paycheck for the sum of the sand removed and a one acre pond as the results of excavation. Because the depth of the pond was dictated by the amount of the useable road construction sand the vast majority of the pond is roughly 4 to 6 feet deep with one area dropping down to 25 feet in depth. As a result portions of the pond go dry during a summer that refuses to drop much rain. While I use to view this as problematic it’s turned into an eye-opening experience as the soft bottom of the pond reveals detailed tracks of every animal that comes to drink from the remaining deeper water hole. 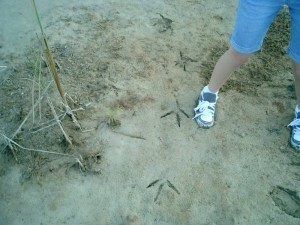 We’ve found tracks from many animals that we typically don’t see including big cats and bears, to wolves and cranes. That’s not to mention that the pond in itself has created it’s own little ecosystem of plants and vegetation that have come to attract other game animals such as ducks and geese. Although there’s nothing more than a frozen mass to see here today I’ll return later in the year for closer observations. If there was any drawback to the construction of this pond it would be the loss of natural berries. This entire area was thick with raspberries that attracted many neighbor berry pickers as well as numerous black bears. And yet, two more wood ticks crawling across my coat are plucked and tossed to the ground. I can only imagine the amount of ticks I’ll find attempting to burrow into my skin once I get back home. Although I find the tick nothing more than a nuisance some ecologists state that the presence of a thriving tick population represents a healthy ecosystem. I see the underlying meaning and the representation but I don’t get quite that involved with the health of the habitat. I can say that if you were to walk this property in sections and realize the transitions of forest, the diverse landscape that has evolved, as well as the native plants and animal life, the conclusion would likely side with that of the ecologist. Maybe the wood tick is right after all. He wouldn’t be here if the host animals weren’t here. And the host animals wouldn’t be here if the ecosystem wouldn’t sustain them. And I would have been less likely to follow. Perhaps I only need to study that fat cat laying in the sun with the big bulbous ticks hanging off the back of it’s neck like ripe grapes to know everything is alright with the property. The truth is our snowstorm is approaching and these late season storms can dramatically impact the deer herd. While the deer are able to easily get new growth grass and legumes right now this new pile of snow will likely kill the plants that are less than hardy. 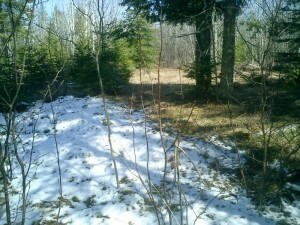 It will also create yet another barrier for the deer to conquer before getting down to some sustainable food. And, if the effort put forth to get that food exceeds the intake received from eating it the deer become susceptible to starvation. As so happens to many animals that reside in areas with long winters, just a couple weeks or one single storm can make the difference between survival and death. And as a result the loss of game animals also changes the environmental landscape. While I’d give the property and the wildlife on this property a good grade at this moment another week may inevitably be the deciding factor dependant upon the snowfall. Click any game below to launch the portable player which includes this list of featured games.